The largest online e-commerce companies in the country are Amazon and Flipkart. 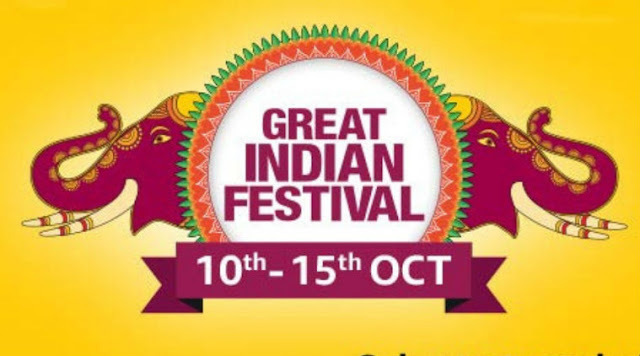 The Amazon is again in 2018 with its Great Indian Festival Sale Today, on Tuesday, the Sale started for the prime member, For those who are not Amazon's prime members, this Sale will begin on October 10, If you are a prime member of Amazon, today, during the sale, you can take advantage of the deals found on many products in different categories. There are many options with the deal. If you pay with the credit or debit card of State Bank of India, you will get a discount of 10% on the purchase of the product. Let's know about all offers in detail.There will be thousands of products available at a discount By combining your purchases with bundled offers you can save even more. OnePlus 6- Amazon is offering attractive discounts on all variants of OnePlus 6 during the sale this year. Its 6 GB RAM and 64 GB onboard storage variants will be available for Rs 29,999. The device is listed at Rs. 34,999. All variants of OnePlus 6 will be available with exchange offer and no-cost emi option. Radmi V2- Amazon Great India festival cell will have 4 GB RAM and 64 GB onboard storage variants of Radmi Y2 in only 10,999 rupees. While its true price is Rs 13,499. Samsung Galaxy S9 - popular smartphone Samsung 64GB variants of Samsung Galaxy S9 can be bought for a discount of Rs 42,990. Its actual price is 62,500 rupees. Apple iPhone X-Apple iPhone X (64GB) variants can be bought at Rs 69,999. By the way the phone has been listed with a price of Rs 91,900. You can also buy Apple iPhone X on a no-cost emi. For this, it will have to pay 7,777 rupees every month.